Now building in Lake View Estates or The Vineyards. Upon entering the Lake Club, you will notice a sense of tranquility as you pass a beautifully landscaped entryway and travel along a scenic drive to the grand clubhouse. Build your John Cannon home from the $900s plus homesite. For additional information please call Jason Suedhof at 941.907.8131 or 941.806.9870. Welcome to The Islands on the Manatee River, a gated waterfront community. The Islands, including Harbourside and Rio Vista is centrally located on Florida's Suncoast between Tampa and Sarasota, build your John Cannon home on the river from $800s plus homesite. For additional information please call Don Miller at 941.444.6466 or 941.302.0141. Exclusivity and luxury define The Concession. Only 236 golf and custom estate homes are planned for the 1,200 virgin acres of century-old oaks, towering pines and protected wetlands. Build your John Cannon custom estate home at The Concession from the $1Ms, plus homesite. For additional information please call Blaise Bright at 941.907.9009 or 941.320.3239. Legacy Estates is an exclusive enclave of luxury homes within the Esplanade on Palmer Ranch community. Legacy Estates is ideally located near excellent schools, shopping and recreational facilities. The community has direct access to Legacy Trail, a 10-mile public trail perfect for walking, jogging and biking. Siesta Key Beach and Longboat Key are within a five-mile radius as are three major medical centers, beautiful golf courses and a convenient array of retail centers. For additional information please call Evan Grigoli at 941.383.5886 or 941.302.4097. Country Club East is a private, gated community of single-family homes located within Lakewood Ranch that offers pristine landscaping and panoramic views. The preserved wetlands and woodlands weave throughout the neighborhoods to present nature at its very best. Build your John Cannon home in Country Club East from $600s plus homesite. For additional information please call Bob Boyd at 941.228.1258. This is a place to put down roots, grow and enjoy a lifestyle that begins a legacy that lives for generations. This is a community with A-rated schools; cultural centers; a hospital and medical center; a seemingly endless variety of cuisines; eight growing shopping districts; 36 holes of private golf, 18 holes of daily-fee golf; 18 tennis courts; polo, cricket; over 80 clubs to choose from and more than 150 miles of trails to walk, bike and explore. Every home built in Lakewood Ranch has used products and techniques that result in healthier, more energy efficient homes. As one of the approved builders, John Cannon Homes is proud to be a part of this environmentally responsible movement. Lakewood Ranch is located on Florida’s Gulf Coast, conveniently close to I-75. Experience the beauty and elegance of majestic oaks and preserves at Rosedale Links. This neighborhood features estate-sized homesites with no CDD fees. Build your John Cannon home from the $500's plus homesite. 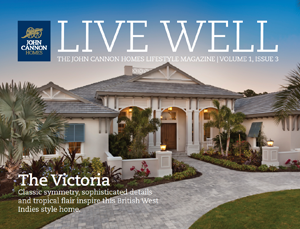 Custom Luxury Homes by John Cannon, located just minutes from Siesta Key's white sandy beaches and vibrant nightlife. It is here you will find this exclusive enclave of only eight homesites where John Cannon and his team will design and build the home of your dreams. This gated waterfront community offers a unique blend of coastal architecture, upscale amenities and first-class services in a relaxed and connected community. Many homesites boast direct canal or lagoon frontage and boat docks while all residents enjoy easy access to world-class boating and fishing on Tampa Bay. Build your custom John Cannon home in MiraBay from $900s plus homesite. For additional information please call Mark Grigoli at 941.361.1300. Gracious country living only five miles east of I-75, The Forest encompasses 270 acres of pines, oaks, recreational lakes and wetland preserves along with wildlife and bird habitats. Low-impact guidelines protect the integrity of the land, providing for expansive preserve areas and natural filtration of water. Build your custom John Cannon Home at The Forest for $900s plus homesite. Beyond the entrance and winding drive of this gated community, over 700 acres are accentuated by 100 acres of lakes, pines, palms and old oak hammocks. Only 262 homes define this exclusive and intimate setting, 200 with direct golf course views. Build your John Cannon home at The Founders Club from the $1Ms plus homesite. Stonelake Ranch is a private community on Lake Thonotosassa that combines expansive rolling hills with breathtaking lake views offering an array of outdoor activities to its residents. Build your John Cannon home at Stonelake Ranch from the $900s plus homesite. Coming soon to Sarasota, Florida. Complete the Contact Us page to join our Skye Ranch Interest List for updates and model information. Call 941.361.1300 for more information. Skye Ranch will be located at the intersection of Clark Road and Lorraine Road (formerly Bee Ridge Road Extension). Surrounded with grand old oaks and lush palms, forested wetlands, pristine lakes and native wildlife the Skye Ranch community will also offer miles of planned trails to connect you to nature, cozy parks and the exceptional planned amenities. Conveniently located to A-rated Sarasota schools, Gulf Coast beaches, top medical facilities, employment, every day and upscale shopping, entertainment, cultural activities and I-75. Within Skye Ranch, live the inspired Esplanade lifestyle in Esplanade at Skye Ranch. Planned resort amenities will provide residents with unique and plentiful opportunities to live the inspired lifestyle and stay active, fit and relaxed. This planned gated enclave of detached villas and single-family homes brings a touch of the Mediterranean to Southwest Florida with its regional-inspired architecture. Join the VIP interest list today to receive email updates on community progress, including floor plan releases, pricing information, pre-sales events and grand opening invitations or call 941.361.1300.